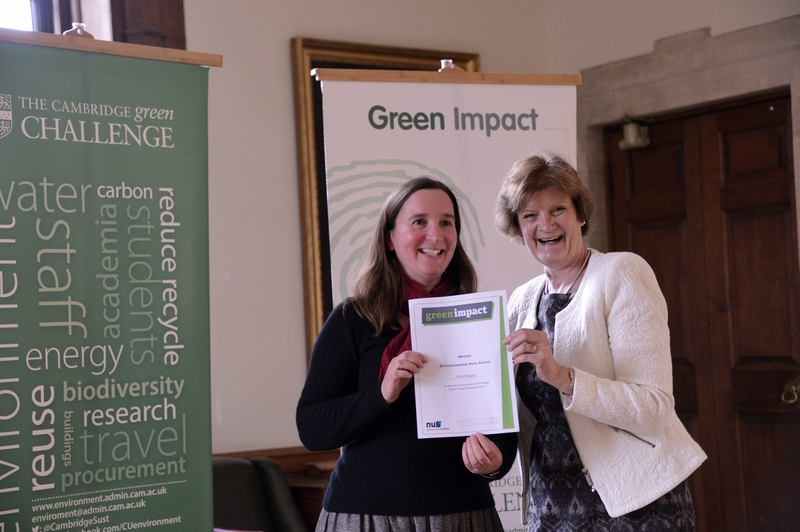 In June 2016 the Environment and Energy Section hosted the University's fourth Green Impact award ceremony, celebrating the achievements of 43 teams in departments and colleges who spent the last academic year striving to make the University more sustainable. Dame Fiona Reynolds presented the awards, which took place in the University's Old Schools Combination Room. 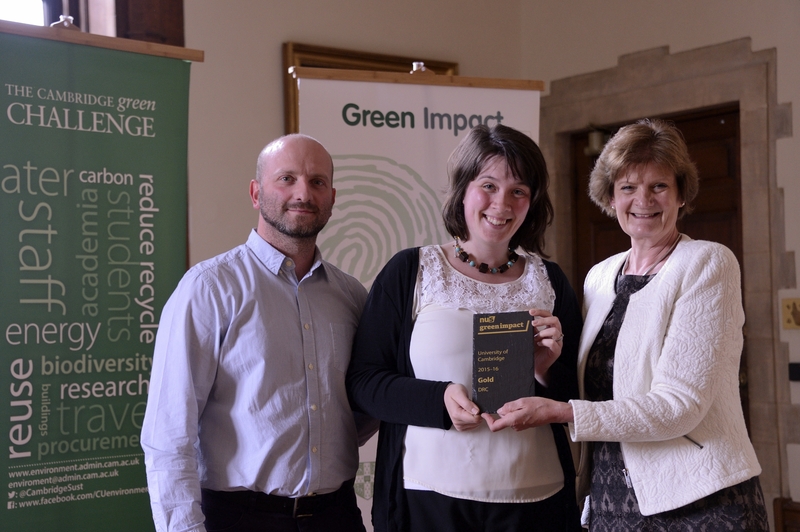 This page summarises all the winners from Green Impact in 2015-16. A slide presentation which was displayed at the awards shows some of the highlights of this year's awards, including statistics, league tables, quotes from the student auditors who reviewed each team's achievements, and photos of some of the teams' initiatives. All the photos from the awards ceremony are available on the Environment & Energy Facebook page. Silver award winning teams will have built on their Bronze efforts to begin to engage with senior management, students and with the rest of the University via an active Environment & Energy Coordinator. They will also have run their own environmental events, and considered in detail issues such as energy use and the efficiency of new equipment. Gold teams have built on Bronze and Silver achievements by taking action on areas such as biodiversity and interaction with the wider community. Gold teams also examine and improve complex areas of their own personal impact in areas such as procurement, travel and water. 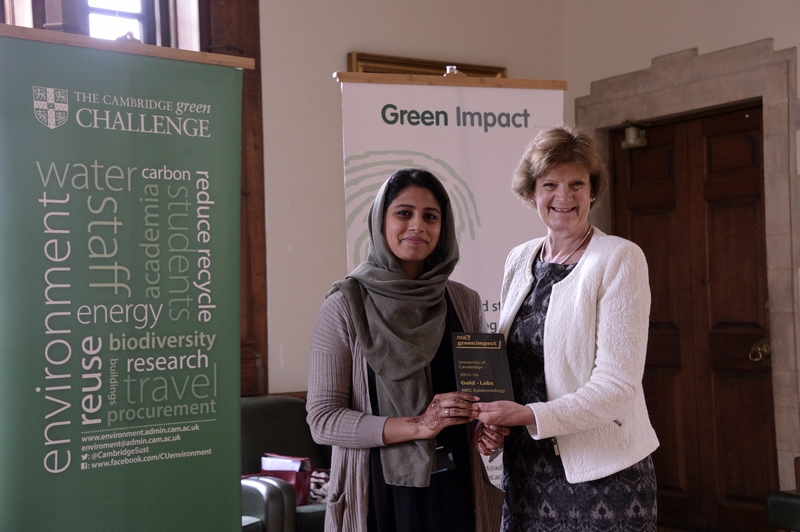 College teams who have won an award through Green Impact will have completed more than 20 actions to green their operations and communicate environmental issues to staff and students across areas such as catering, grounds maintenance and accommodation. 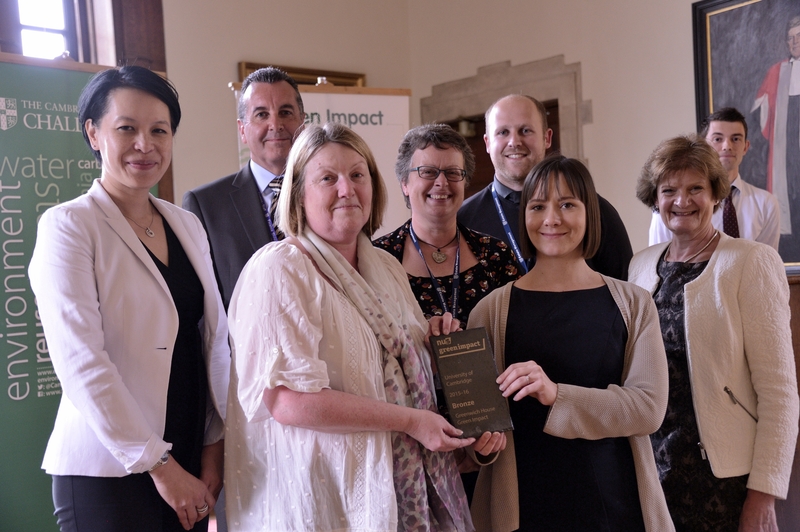 The Laboratory awards are a new addition to Green Impact aiming to recognise best practice in sustainable lab management. Achieving an award shows that a lab’s environmental impacts are carefully managed, from chemicals and materials to equipment and even training. At Clare College, a small student-led team worked on a project to deliver a Carbon Zero May Ball at Clare for 2016. The challenging aims included zero net greenhouse gas emissions, and no more non-recyclable waste than on a normal day at the College. Thanks to extensive measuring, monitoring and reporting on the project, the team has been able to develop recommendations and guidance on the event to be communicated to other colleges and organisations running similar events. The University’s Maintenance Unit ran a project which aimed to increase the use of pool bikes instead of pool vehicles. The team carried out a full review of the current pool bike scheme, including through a staff consultation event, they looked at options for expanding and improving the pool bike offering, including procuring bike odometers to measure use, investigated a new booking system, and have put in place plans for a new bike shelter. The PDN Green Team aimed to reduce the impact of freezers across their three buildings. By carrying out a freezer audit of all of their -80C and -20C freezers, and developing a database listing a range of information about each one, the team have been able to identify units which need replacing or repair and the team have worked to improve the way freezers are used in the department. On top of this, the team also directly monitored the energy use of several freezers to give average energy use figures, providing a useful estimate of total energy use. The department is now in the process of putting in place actions and developing guidelines for the department. The School of Clinical Medicine’s project also looked at their freezers across the departments in the school. They produced a survey of all freezers, and based on the findings wrote a proposal to all the Heads of Department in the School, with many of the proposals accepted and implemented immediately. The project has resulted in all departments developing a Freezer Management plan, increased the minimum temperature of freezers, and introduced an electronic inventory for every freezer in the School Departments. The team now aim to implement a replacement schedule for freezers over 10 years old across the Clinical School. CISL’s ‘Sustainable Food At Work’ project aimed to use food, and the interaction with food topics within the department, as a means of promoting sustainability. Work within this project included reinvigorating the departmental vegetable patch by surveying staff and recruiting 21 staff volunteers to work on the garden, reviewing internal food and beverage purchasing to ensure the use of 100% Fairtrade and organic products, drafting new sustainability guidance for staff booking catering at external events, and drafting guidance for external suppliers. The Green Impact Special Awards aim to highlight projects and individuals which have gone the extra mile as part of, and alongside Green Impact. This award aims to recognise an exceptional person who has become the environmental hero within their department or college. This year's winner was Fiona Riggall, from CISL. Fiona’s leadership and enthusiasm embody the characteristics of an Environmental Hero. She has demonstrated her commitment to inspiring change and she truly leads by example, with her efforts inspiring the whole organisation to assess, and in many cases redouble, its efforts to reduce its environmental impact. Rather than preaching or coercion, Fiona has delivered this through the much more effective route of leading by example, showing others how it is possible to achieve results without sacrifice, and in fact have great fun and reward in doing so. This year's Runner-up was Emma Cook from Obstetrics & Gynaecology department. Emma’s efforts haven’t been limited to getting the bronze, silver award and now dual gold awards for her department. Emma has rallied her department’s team, organised and guided the meetings, come up with or shaped the innovative ideas and projects in the department and has really turned the department into a far greener place. The work Emma has done has not just helped the planet but also raised money for charity, while also bringing more fun and excitement to the department. The Environmental Improvement award aims to recognise innovative environmental improvements or initiatives put in place by a team or department. Joint Runner-up: The Relocation of Chemistry’s servers to the West Cambridge Data Centre. The scheme resulted in significant energy and carbon savings to the University of just under £10,000 per year, with 5 more still to be moved. Joint Runner-up: The Department of Politics and International Studies' new, online admissions database, developed by a member of the Green Team together with UIS replaced paper coversheets in 2015-16 for two courses, saving 6,000 sheets of paper. There are now plans for the database to be rolled out within the School to nine other Departments in the next year. 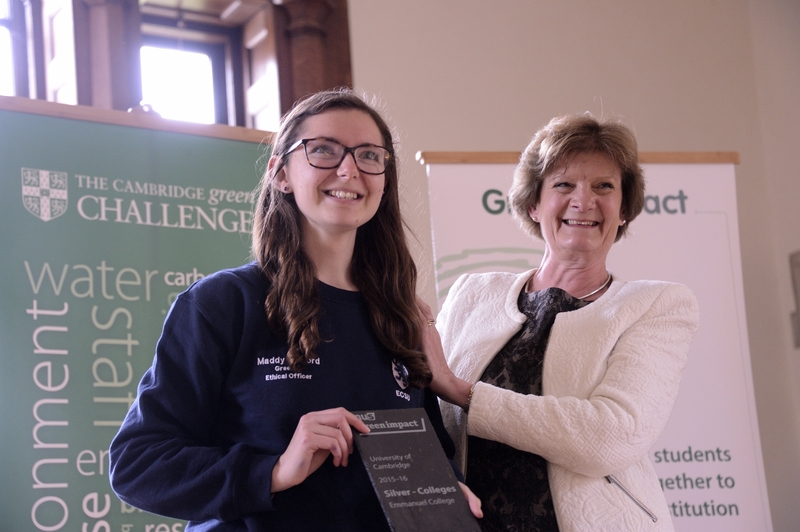 Winner: Deborah Hoy’s intervention to fundamentally change the heating schedule at Clare College was chosen by the judges for its bold approach, and for the significant resulting energy and carbon savings. The initiative resulted in boilers being switched off entirely during the summer months. It is now supported by a new College Heating Policy, and has led to a 7% cut in gas use in a single year, saving the college nearly £30,000 annually. This year’s student leadership winner was Amy Carmichael. Amy has been a hugely energetic undergraduate green officer. She has expanded efforts to encourage students to save energy, used talks and formal halls to encourage people to eat less meat, and most extraordinarily, has come up with the imaginative but hugely challenging target of making this year's Clare event the first ever carbon-natural May Ball, winning an 'Excellence' award for the College on top of their staff-led Gold award. The runner up was Patrick Lundgren. Patrick was the Green Officer at Robinson College, helping to win the College a Green Impact Gold award along with the MCR Green Officer and college staff. 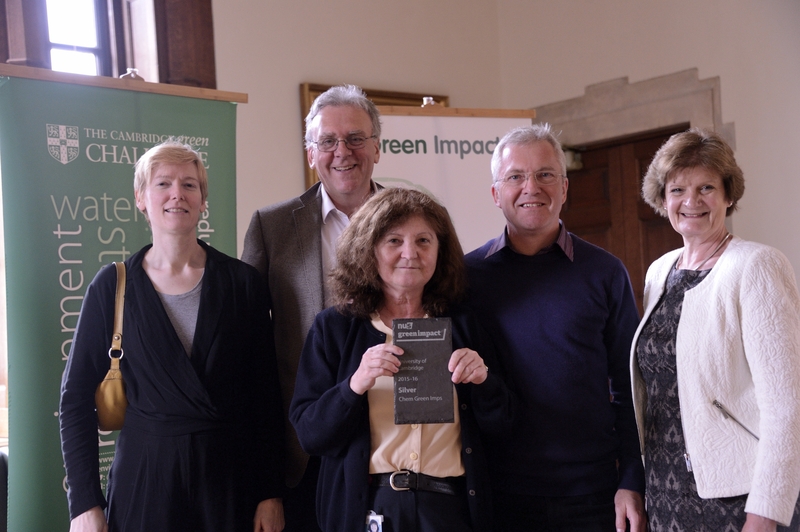 Having gained familiarity with Green Impact as a Green Impact auditor last year, Patrick was able to make suggestions and propose ideas to the team, he was involved in initiatives such as a Green Week, and acted as a committee member of the Cambridge Climate and Sustainability Conference 2016.